Northallerton based community project Wheels 2 Work is one of 29 projects awarded a share of £153k grant funding from a regional fund supporting local communities throughout Yorkshire and Humber in time for Christmas. Competition for funding was tough. Social housing consortium Efficiency North’s EN:Able Community Investment Fund received over 100 applications for a total of nearly £900k. Bids were received from a diverse range of excellent projects working to support the communities of social housing landlords throughout the region. 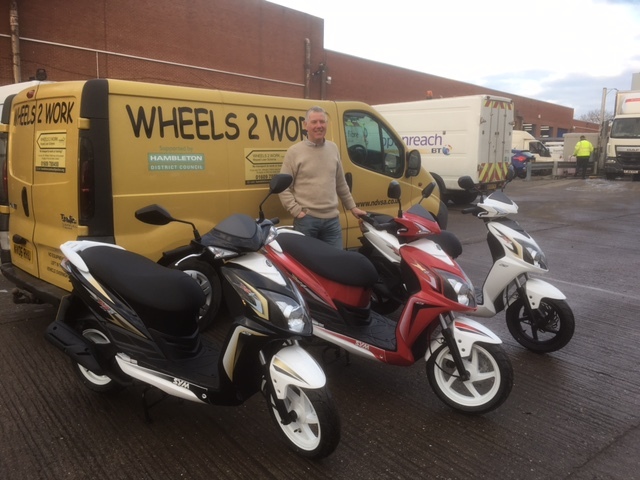 Wheels 2 Work is a motor scooter leasing scheme covering Richmondshire, Hambleton, Harrogate and Craven aimed at helping people get over difficulties in getting to work, where no suitable alternative transport is available. Successful candidates receive a moped, riding equipment and fully comprehensive insurance after completing their Compulsory Basic Training. The funding received has been used to purchase three 125cc motor scooters and a 50cc scooter will be delivered shortly. These scooters will make a huge difference to many people in the coming years and enable them to take on work and training that would have been impossible without the scheme. The EN:Able Community Investment Fund is generated through Efficiency North’s procurement frameworks for construction and maintenance schemes for social housing. The Fund is targeted at local projects that are sustainable over the long term, provide local employment opportunities, encourage self-sufficiency and that will also provide long term benefits for the wider local community, reflecting the 4 strategic aims of Efficiency North’s vision. The fund will open for its next (sixth) round of applications in August 2017.